Happy Easter & welcome to the world, little pups! 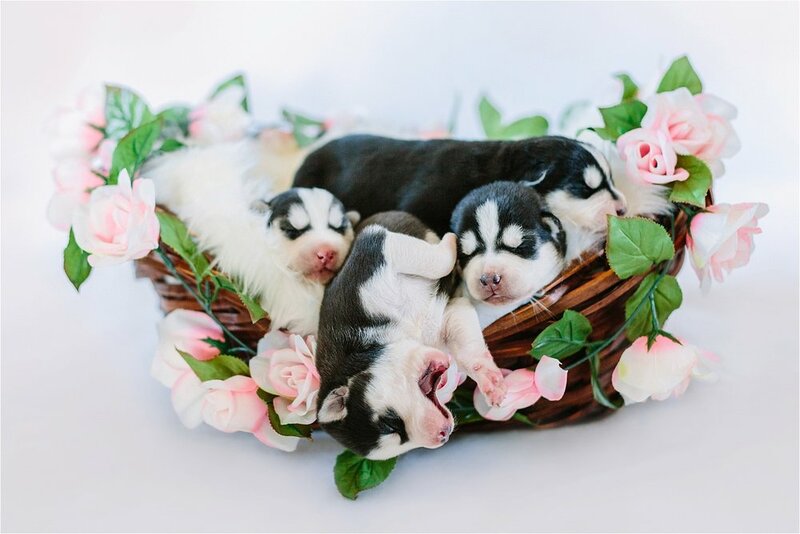 Meet Koda, Shadow, Neko, Balto and Jenna -- five newborn husky babies ready to take on the world! When my fiancé, Donny, and I found out his parents dog, Kloie, was preggers, we knew we'd have to set up a little photo session to capture all of the cuteness. This turned into a time consuming project, but one that we were excited to undertake. All of this was done inside Donny's parents house using as much natural light as possible (which wasn't much LOL). We couldn't risk taking the puppies outside of their home and jeopardizing their health, so we had to take on the challenge of using whatever we had available in order to make it work! I love to be creative and do shoots like this because it truly pushes me to stretch and grow as a professional, figuring out creative ways to accomplish our goals and vision no matter what the circumstances. It isn't always going to be a completely ideal environment for photos, especially when you are relying on natural light which you cannot control. You just have to go for it full steam ahead, have a good time, and make the best of the situation! Being the only girl of the family, Jenna quickly showed the fellas who was boss (and she even showed off her impressive pipes by singing for them)! While only one week old here (eyes closed and all), these once sleepy little gems are now wide eyed rambunctious toddlers running around at five weeks old and displaying crazy amounts of energy (updates will be posted on social media! Be sure to follow!). It's absolutely insane how fast they're growing! In just a few short weeks, they'll be sold to some lucky, lucky families and start lives of their own, blessing their new owners with lifetimes of love.